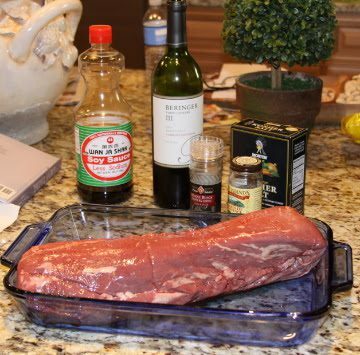 Place tenderloin in large zip-lock bag; pour in soy sauce and red wine. Seal bag. Marinate in refrigerator for 8 hours, turning occasionally. Remove meat from marinade and drain (discard marinade). Season drained beef tenderloin evenly with salt, pepper and herbs. 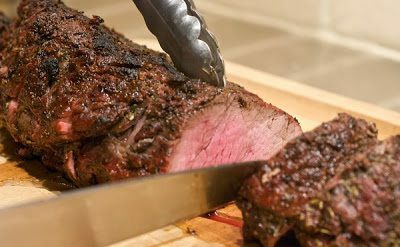 Grill uncovered over medium- to medium-high heat until instant read thermometer inserted at thickest part of beef registers 130°F for medium-rare or until desired doneness, turning occasionally. Transfer grilled tenderloin to platter; cover with foil and let rest for 15 minutes. Slice beef crosswise to serve. Serves 10.